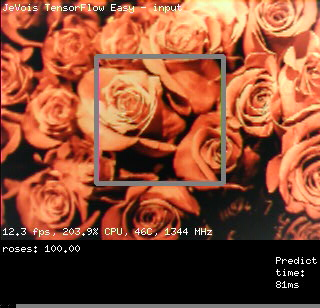 This tutorial will show you how to train TensorFlow deep neural networks using your own collection of images and object categories, and how to run the trained network on the processor inside the JeVois smart camera. It closely follows the steps of the tutorial TensorFlow for poets developed by the TensorFlow team, adding a few steps to get the trained network working on JeVois. Our network trained on 5 different kinds of flowers correctly recognizes roses. Make sure you download JeVois v1.8.0 or later from http://jevois.org/start and flash it to microSD. You need a Linux, Windows or Mac host computer (we used Ubuntu 17.10), onto which you will install and run TensorFlow for network training. You need to be generally familiar software installation procedures, running programs, etc for your host computer. Like in TensorFlow for poets, we will start with a MobileNet network (a small but high performing image recognition network) pre-trained on ImageNet (a large dataset with 1.2 million images in 1000 different object categories). This will save a lot of time compared to training a blank network from scratch. We will install the latest TensorFlow on the host computer. We will setup a collection of training images in several different categories. We will do transfer learning and fine-tune the pre-trained network on our collection of images, switching from the default 1000 object categories to a different number of categories available in our collection of images. This is performed on the fast host computer. We will optimize it for inference and convert it to TensorFlow Lite (flatbuffer) so that it can be loaded and run on JeVois. We will copy the converted network to JeVois microSD card. And finally we will run it from within the existing TensorFlowEasy JeVois module. If all goes well, you should be able to complete all steps in about 30 minutes. Below are details on how to train and deploy your own deep network for JeVois. The first few steps will follow closely the TensorFlow for poets tutorial. We recommend that you look at it as you also follow the steps outlined here, as it provides additional details not duplicated here. We need to have a collection of images that we will use for training. The images should be organized under a number of directories, where each directory is the name of a given object category. After 4000 training steps, which here just took a few minutes, we get an accuracy of 84.8% in our particular run (your results will vary slightly). We are done with the basic TensorFlow for poets tutorial. 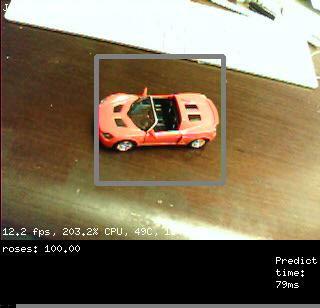 Let us now deploy the model to run on the JeVois smart camera. For that, we will convert it to the mobile-optimized TensorFlow Lite format. We will follow some of the steps of TensorFlow for Poets 2: TFLite which we recommend you check out. But this time we will skip some steps which are irrelevant to JeVois (installing an Android app, etc). tf_files/retrained_labels.txt are the category names used during retraining (note that internally TensorFlow uses a category number, which is then mapped to a name using this file as key. It is hence important that you do not modify that file or change the order of entries in it, etc). If the above command gives you some error, it may be that you are running a newer version of TensorFlow, and this tutorial has not yet been updated. Since we closely follow the TensorFlow for Poets 2: TFLite Android tutorial, refer to that original tutorial on the TensorFlow web site for any updated toco syntax. and comment out any other settings in that file so that the one you just added for flowers is the only uncommented one in the whole file. Point your JeVois camera to the different kinds of flowers we have trained it for (or to pictures of those from tf_files/flower_photos/) and see how well it can recognize them! Our network correctly recognizes roses. 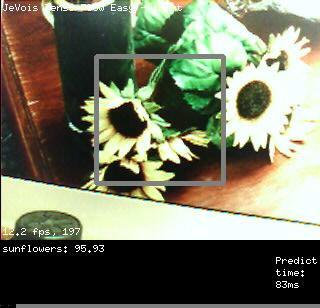 Our network correctly recognizes sunflowers. Note that we did not train a negative or background category in this tutorial. So the model is likely to detect flowers when looking at other things, just because the only things it now knows about the world are those 5 types of flowers we have trained it on. Our network incorrectly classifies a car (not among its possible output labels) as roses. Try it yourself with your own pictures! Investigate quantization. The steps outlined above yield a floating-point network, which is slower than a quantized network. The toco utility should be able to produce a quantized network for JeVois, but we have not yet fully figured out how (some issues with normalization and ranges of values).